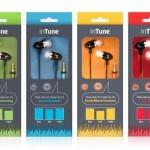 While we were at CES 2011 we came across Fuse Intune Earphones. Since we lost a set of earbuds on the flight out were were inclined to stop at every earbud dealer. After our stop at the Nvidia booth, we found a very nice display from Fuse. Fuse has different brands of earbuds, from the “Skullcandy” kid friendly to the colorful. It is not uncommon for people to buy the best looking earphone with out even listening to them. 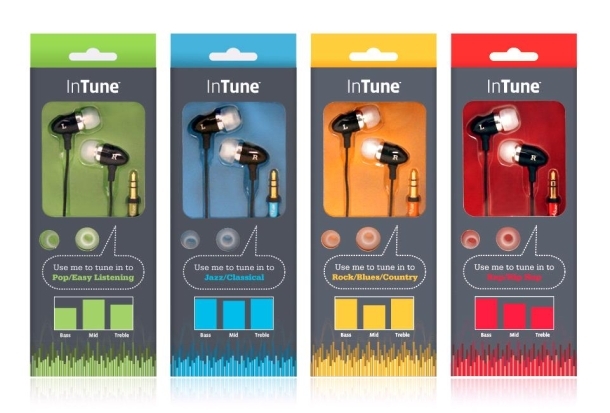 After perusing their wares, we found the InTune brand, which tunes their earphones to the type of music you listen to. They have Pop/Easy Listening, Jazz/Classical, Rock/Blues/Country, and Rap/Hip Hop. Each set has a different driver that is designed for that type of music. The packaging helps you define which earphones best suit your genre by a graph of the sound curve on the box. We listened to them all many times over. They all produced different sound curves. What we realized during our listening experience is that we do not listen to one type of music. The Pop/Easy Listening had too much mid range, the Jazz Classical didn’t have an tonality, the hip hop had too much bass and not enough highs. Our end result was to get our hands on the Rock/Blues/Country Version because they best fit all of our listening needs. The rock/Blues/Country had the best overall sound and the EQ setup was just a little bit of a smiley face, the way we like it. The cable doesn’t keep any shape, which is good. I wrap my earphones around three fingers and push the jack through and that is how I leave them until next time. The cable is a bit sticky, not like glue or tacky, but you cannot pull them out of your pocket very easy. The downside to all the earphones, is that they have a hard time getting set in your ear. I noticed, I reset the earbud in my ear at least once if not twice during a listening session. They also feel heavier so that may be the problem with having to re-seat them. The longer you wear them, you get used to them, but I felt like I needed a break from them after a long session. Currently I use them for writing and listening to music and they are now my go to earphones, or the ones I do not wish to lose, so I keep them in a safe place. Overall we found these earphones to sound better than the Logitech earphones we looked at earlier in the day, and we even went back to the Logitech booth to compare. One thing we did mention to the Fuse company was their packaging did not set them apart and it would be hard to compete against the flashier type of advertising. But with a $24.99 price tag, they are worth the purchase.